Everywhere Christ traveled, He found people who were hurting—physically, emotionally, and even spiritually. He provided solutions, whether it was in the form of a direct miracle of healing, or by proposing some key lifestyle principles based on His truths. Though we may not raise the dead or cure cancer on TV, this is an area where Lifestyle Magazine endeavors to make a difference in countless lives every time these programs air. Conservatively, we can say 4 million people view our show every week, but this figure does not even begin to include the potential broadcast footprint we reach on both Christian and secular TV networks during any given week. Our intent is to minister with no strings attached, to simply bless viewers—just the way Jesus did. 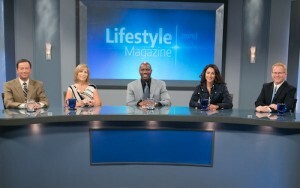 Lifestyle Magazine is our gift to viewers everywhere as we all seek to lead more abundant lives. Faith Friends help to keep Lifestyle Magazine on the air. We invite you to join the team! For your gift of $25 or more, we will send you your own DVD copy of the award-winning episode Vegan All Star with 4 time NBA Champion John Salley. We will also include a single copy of the Vibrant Life Magazine “Going Vegetarian”. You will see first-hand the fruits of your faithful support, and the potential of what MORE we can do together!